Galway pipped Mayo in this bottom of the table clash to win their first 2 points of the season. With a man advantage thanks to Mayo losing Michael Murphy to a sending off early on, Galway looked to hold a comfortable lead late in the game. However, it was a close exciting finish with Mayo’s Gareth Price netting just over 15 minutes into the second half. Mayo held a brief lead, only to see Galway to recover and put five points over the bar in quick succession. Galway held a slender one-point lead at the break. Mayo opened the scoring with points from Price and Mark Fehilly. Jarlath McGeeney opened Galway’s account, and Fehilly responded in kind for Mayo. Conrad O’Reilly put one over for Galway and the Brighton side began to make their one-man advantage count. As things dried up for Mayo’s forwards, Galway’s found their stride and pointed three times to one for Mayo before the half. After Galway added another point following the restart, Mayo decided to make a run at going for the win. Price put a long range free over the bar from the ground, and then rifled a goal home. Mayo added another point from Aiden Campbell and urged on by their supporters led by three points. Galway did not panic. A Peter Nolan free and points from Donal Redmond and Niall Kilcoyne erased Mayo’s lead. With the chance to press their advantage home, Galway added points from Gearoid O’Connor and Redmond. Price got one back for Mayo to pull within one, but the red and green did not have enough left in the tank to salvage a result from the game. Galway: A. Ready, S. Melia, P. Cummins, S. Leamy, M. Norbie, S. Gallagher, G. McArdle, P. Hackett, C. O’Reilly, N. Kilcoyne, J. McGeeney, D. Redmond, G. O’Connor. Mayo: A. Townsend, F. Coyne, M. Murphy, K. McLaughlin, K. Comer, R. Murphy, M. Fehilly, G. McAllister, G. McTaggert, D. McLaughlin, A. Benson, A. Campbell, G. Price. An entertaining but testy game of hurling went down to the wire as Galway battled for three quarters of the game with a man down. Aidan Callnan was shown a red card after a dangerous challenge after 15 minutes of play. At the time Galway held a slight lead that they managed to maintain until half time. In the second half Tipp pulled ahead with points from Shane Burke and substitute Pat Leahy, but Galway almost salvaged a point as the tribesmen drew level with a minute left only to see Paul McGrath put the winner over the bar for Tipp in injury time. 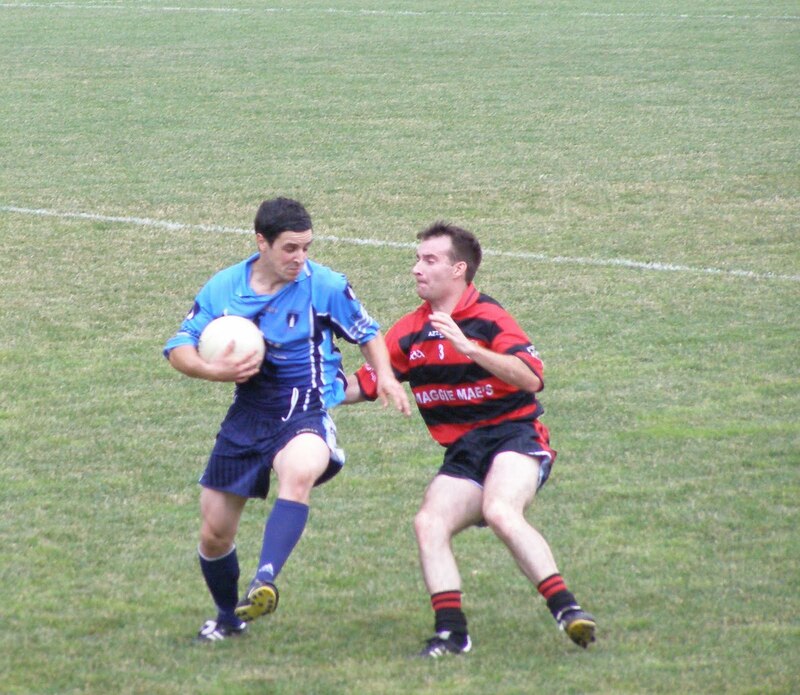 Shane Murphy meets the ball with Kieran McGrath in close pursuit. The first half was marked by the sending off of Galway’s Aidan Callnan after 14 minutes who was adjudged not to have been challenging for the ball when swinging his stick. Galway held a one-point lead at the time and managed to extend it to two by half time. Shane Murphy was the marksman for the westerners, tallying four points from frees. A goal came from Kilkenny native Willie O’Dwyer whose low drive ended up in the back of the net. Tipp’s Shane Burke inflicted a lot of damage on Galway with some well taken points from play, while Michael Gleeson and Martin Boran each pointed twice. With the extra man, Tipp’s defence mopped up numerous aimless balls played into the Galway forward line as scoring became more of a challenge for the tribesmen, but their back line held firm. At the half Galway led by a score of 1-6 to 0-7. 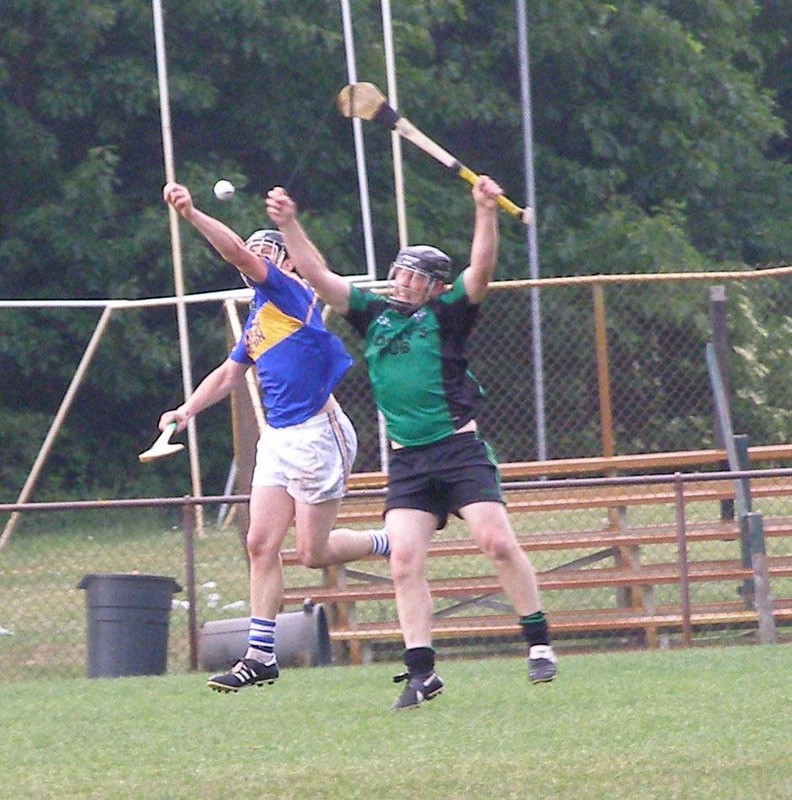 Mike Meehan clears the ball for Tipp. Tipp set about overturning Galway’s lead and went on a 6 points to 2 scoring streak to open the second period. Derek McNicholas, Burke, and substitute Pat Leahy turned the tide on the scoreboard. Murphy put Galway’s 2 points over the bar as life got tougher for the Galway forward line. Galway moved Shane Maher to the edge of the small square, and Maher caused havoc with Galway floating high balls his way. 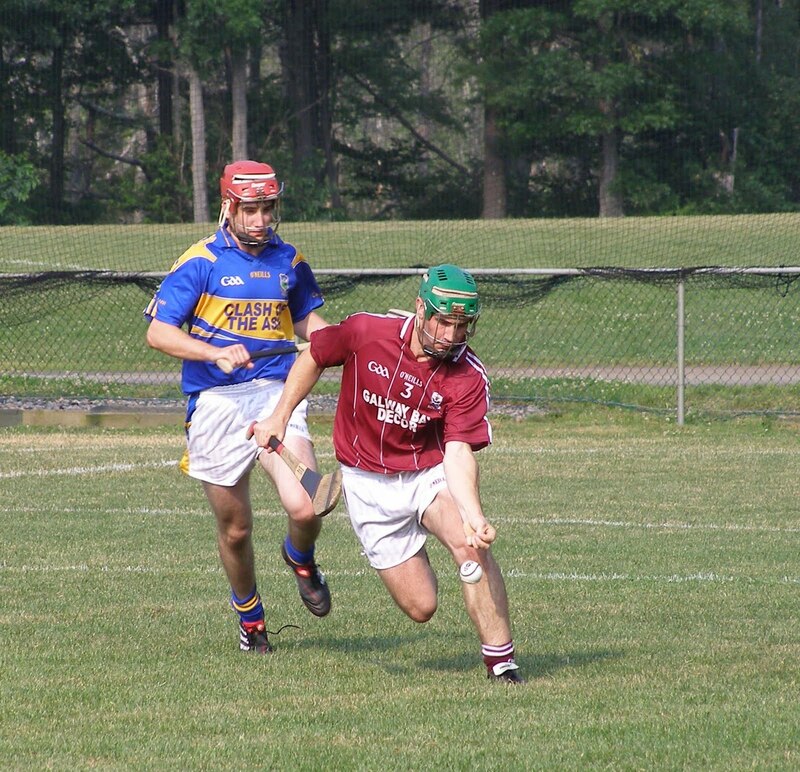 Galway won a 21-yard free, and with plenty of time on the clock, Maher went low and Tipp saved the shot. Maher converted his next chance as he got on the end of a Greg Lally ball, and soon afterwards looked to have won a penalty after catching a high ball and getting dragged down, only for the umpire to have judged that he was in the small square before winning the ball. With the reprieve, Tipp gathered themselves and Martin Boran relieved the pressure with a point. Galway pulled themselves level as the anticipation rose around the ground. Enda Concannon pointed and Shane Murphy converted a free with a minute left. Murphy had a chance to put Galway ahead with a long range free, but the ball drifted wide. In injury time Paul McGrath, who entered the fray in the second half, made room for himself and from 25 yards put the winner over the bar for Tipp. A close call for Tipp, and a game that will leave Galway wondering what might have been. Galway: E. Ward, J. O’Callaghan, C. O’Driscoll, G. Lally (0-1), B. Regan, J. McCormack, M. Farrell, A. Callnan, S. Dineen, S. Maher (0-1), E. Concannon (0-1), S. Murphy (0-7), W. O’Dwyer (1-1). Tipp: T. Lowry, B. Kenny, K. McGrath, M. Meehan, K. Joyce, S. Hickey, C. Dempsey, J. O’Keefe, M. Gleeson (0-2), D. McNicholas (0-1), S. Burke (0-6), A. Devine, M. Boran (0-3). Subs: P. Leahy (0-2), P. McGrath (0-1). Armagh-Notre Dame comfortably took two points from a Cork side that kept themselves in the game by way of the goal, but as the afternoon turned into evening in the last game of the day, the sun set on the hopes of the rebels of pulling off a victory. Cork battled gamely for the 60 minutes, but against a more balanced Armagh-Notre Dame, which contained a deadly forward line combination of David Quinn and Seamie O’Hare, were unable to keep pace over the distance. Dominic Magill gets his shot off under pressure. The Brighton side picked off points early and took a commanding lead. After 15 minutes the men in orange led by five points, 0-6 to 0-1. Early on David Quinn looked as impressive as ever at corner forward, his marker, Aaron Cahilane looked like he would be in for a tough hour trying to pin down his speedy opponent. Dominic Magill opened the scoring with a well taken point, and Quinn followed with 2 quick scores. Derry O’Callaghan opened Cork’s account after 8 minutes, but the northerners continued to enjoy the upper hand. Dominic Magill stroked a nice point over from play and Seamie O’Hare put two frees between the posts. Cork came back into the game thanks to some hard work from Richard Murphy in the forward line and midfielders Derry O’Callaghan and Stephen O’Donoghue. Murphy pointed, and Arlen Ahern reduced the deficit to three points a minute later as Cork gained some footing. Colin Crowley goaled off the inside of the far post after 19 minutes the sides were level. Cork then took a one point lead and the game went from a one sided affair to very interesting contest indeed. Quinn then leveled with a superb strike. After O’Hare restored Armagh-Notre Dame’s lead with another free, Quinn.got on the end of a ball played in by O’Hare and goaled with a fine finish. Cork again got back into the game with a second goal, this time Niall Coakley finished a great move that involved Colin Crowley and Richard Murphy to make it a two point game at the break. Cork defenders put Darren Gilsenan under pressure. There would be no second half comeback for Cork however. Armagh-Notre Dame put a stranglehold on the game and Cork tired as time wore on. The second period opened in the worst possible fashion for the rebels, Quinn goaled a second time and O’Hare added two points. Armagh-Notre Dame now led by seven points. After Darren Gilsenan put the third goal away for the Orchard County another Cork comeback looked unlikely as key players ran out of steam. Substitute Shane McCarthy brought some spark to Cork’s forward line and tallied a goal and a point for the rebels in the late stages. A satisfactory two points for the northerners while Cork still looking for a winning formula. Armagh-ND: D. Burke, D. Hughes, J. Cooper, F. Meehan (0-1), M. Graham, G. Gilsenan, C. Bergon, C. Brophy, P. Cadden, D. Magill (0-2), S. O’Hare (0-6), D. Quinn (2-4), D. Gilsenan (1-0). Cork: A. Seymour, A. Mackey, A. Cahilane, K. O’Leary, J. Foley, R. Kirwan, D. O’Callaghan (0-1), S. O’Donoghue (0-1), C. Crowley (1-1), R. Murphy (0-1), C. Caffrey, A. Ahern (0-1), N. Coakley (1-0). Sub: S. McCarthy (1-1). Christopher’s will have been the more disappointed of the teams with the result. Having trailed for three quarters of the game, Christopher’s persistence paid off, and a flurry of scores in the second half saw the Boston champions take a two-point lead with time winding down. Tones also lost key player Gary Brilly, who was sent off for a second yellow card as time ran out and a win looked on the cards for Christopher’s. However, Tones rallied in injury time to even the scores and maintain their unbeaten record, while from a Christopher’s viewpoint, it was a win that slipped away. Christophers' Sean O'Hare gets his first to this kickout. The Tones enjoyed a significant advantage in the first half and played the much better football. Wing forward, Donal Armstrong, put three well-taken scores over the bar from play as Christopher’s back line struggled to cope with the Tones forwards. The champions also struggled at the other end of the field as they kicked three bad wides during the first 15 minutes, failing to tally a score in the opening quarter. The impressive Armstrong opened the scoring after six minutes. Mike O’Brien and Marty Farrell added well taken scores for the Tones. After a barren first 15 minutes, Christopher’s caught a break and netted through Cathal McNally. McNally side-footed a ball that broke from a challenge between David Nation and Willie O’Dowd into the empty net and the sides were level. The goal did not do much to break the Tones hold of the game however. Armstrong popped up on the wing for two points from play, and Farrell stroked two frees over the bar to establish a four-point lead and keep the Tones very much in control. Hope sprung for Christopher’s as in the final two minutes of the half, McNally put a free over the bar and the Kildare U-21 followed with a point from play. Things then got a little testy; Gary Brilly and Sean O’Hare each received a yellow card for an off the ball scuffle. Having played second fiddle for the first half, Christopher’s trailed by just two points at the break. Noel Ryan challenges Wolfe Tones' Marty Farrell. The second half began with a booming Dan McCabe free from 45 yards that split the uprights, and it was matched in-kind with a Sean O’Hare free from a similar distance for Christopher’s. The sides traded scores as Christopher’s began to find their way into the game. The champions then went on a run and worked their way into the lead. Points from Cork under-21 and Nemo Rangers Clubman, David Nation, Cathal McNally and Barry McNally, propelled Christopher’s into a two point lead. With the Tones losing their way with some wayward passes into the forward line, and with the bit between their teeth, a victory for Christopher’s looked inevitable. With about a minute remaining the Tones looked well and truly doomed when Brilly was given his marching orders. With Christopher’s begging for the final whistle, the Tones found that they had something left in the tank. Marty Farrell brought the South Bostonians within a point and a pointed free from midfielder Mick McGee late in injury time, to the jubilant cheers of their supporters, saved a point for the Tones. Christopher’s can take heart from their second half performance, however will need to learn how to lock the door in crunch time if they are to successfully defend their title. Tones: W. O’Dowd, E. Naughton, N. Devereaux, M. O’Brien (0-1), D. Kinahan, K. Regan, J. Farrell, M. McGee (0-1), D. Armstrong (0-4), G. Brilly, D. Kelly (0-1), D. McCabe (0-1), M. Farrell (0-4). Christopher’s: P. Kenneally, N. Ryan, C. McDonald, C. Aylward, B. McNally (0-1), B. Kelly, D. Kenneally, S. O’Hare (0-1), D. Nation (0-1), A. Moloney, E. McCarthy, D. Ward, C. McNally (1-5). Sub: Buckley (0-1). Aiden McAnespies took the wind out of the sails of a high flying Shannon Blues side on Saturday afternoon thanks to a commanding midfield performance from Brendan McGarr and relentless attacking from wing forwards Donnacha Tobin and Conor Murray. Shannon Blues were hoping to follow up on their victory over Donegal, but spent most of the game trying to catch their opponents. The Blues looked like they would make a run at it in the second half, but when the momentum looked like it was changing in their favour, McAnespies regained control of the game and ran out seven point winners. 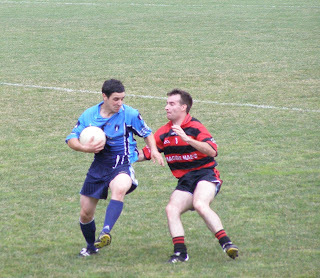 Shannon Blues Michael O'Brien runs at the McAnespies defence. The first half opened with space at a premium as each back line was quick to shut off any window of opportunity for the opposing forwards to find room. The first clear shot did not come for 9 minutes and the first score came 10 minutes into the game. Thomas Corrigan put the ball over from a tight angle for McAnespies. Wing back, Simon Shortall, popped up for a second and Corrigan added a third for McAnespies as at the other end of the field, the Blues forwards struggled against a tight McAnespies defence. Alan Holland put the first score over the bar for the Blues in the 23rd minute and followed with a second shortly afterwards. Conor Murray answered for McAnespies and on the stroke of half time McAnespies goaled to put themselves in a commanding position. Corrigan, the lively Fermanagh youngster, fired home from close range and at the break McAnespies led by a score of 1-4 to 0-2. McAnespies Colin O'Sullivan ships a hefty challenge. The second half was a much more open affair from a scoring standpoint, but was marred by several scuffles. The Blues gained some traction, but as they crept within striking distance, McAnespies closed the door. Still trailing by five points, the Blues got within two thanks to points from Michael O’Brien and two from Holland. The manner in which the Blues swept upfield for their fourth point of the half looked ominous for McAnespies, combined with an impressive block by Shannon Blues center back, Noel Galvin, on Tobin who was bearing down on goal at the other end. McAnespies dug deep however. McGarr dropped back to help the defence, while Tony McClelland and Colin O’Sullivan in the half back line worked hard to change the tide. A point from Murray and another from McCrory from the ensuing kickout put McAnespies back into a four-point lead. Murray re-opened the gap to five points with a superb strike from near the sideline. After the Blues pointed from a Holland free, McAnespies hit with a second goal to kill the game. Tobin palmed a high ball played across the box by Murray into the net. The sides traded points to finish out the game. McAnespies will be pleased with the win, and judging from this performance are on track to regain the Boston championship. The Blues looked strong and at times played some nice football, but will need to find a way to spread the scoring if they are to go one better and raise the cup this year. Blues: A. Garry, S. Kelly, T. Wallace, S. Lennon, D. McElligott, N. Galvin (0-1), P. Murray, M. O’Brien (0-1), JP Murphy, P. McGee, A. Holland (0-7), J. Burke, T. Maloney. Macs: S. Connolly, D. Wylie, M. Boyne, C. O’Sullivan, T. McClelland, S. Shortall (0-1) N. Donaghy, B. McGarr, D. Tobin (1-0), T. Diamond, C. Murray (0-3), C. McCrory (0-1), T. Corrrigan (1-3). Subs: L. Sweetman (0-1), C. Hands (0-1). Boston GAA update with Denis O'Brien. 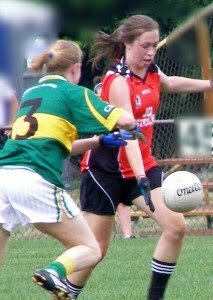 Tír na nÓg took up from where they left off last year and drew first blood in this Ladies senior football encounter. 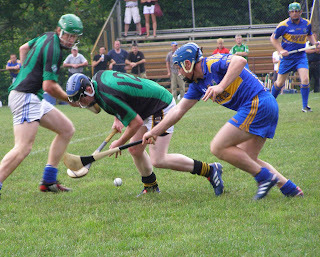 The Shamrocks struggled to match the Tír na nÓg midfield. Emma Conlon exerted enormous influence on the game with much of the play going through her, and showed that she is also capable of taking her own score. 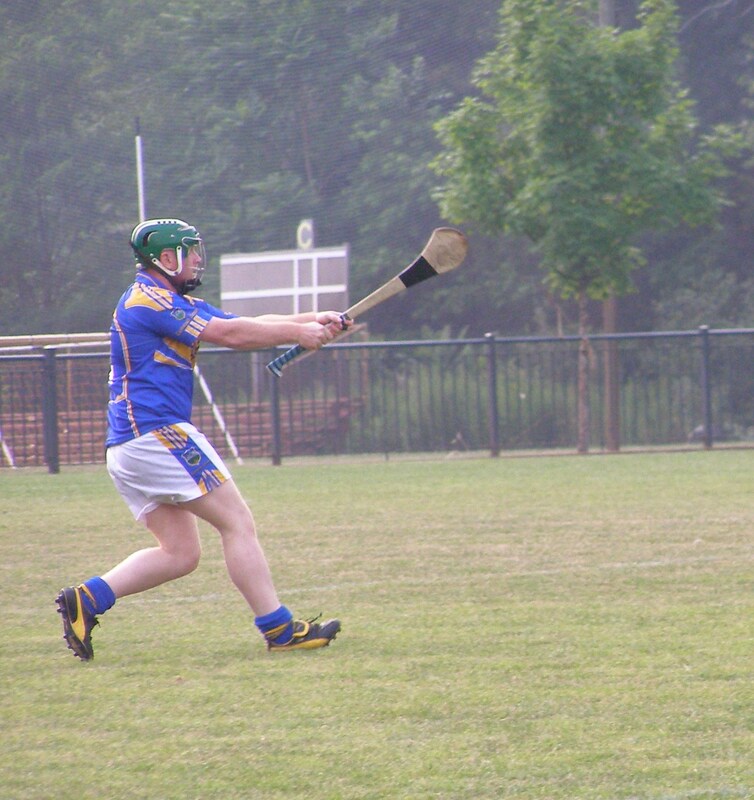 In the second half Laurie Ahern lifted things for Tír na nÓg and helped prevent a Shamrocks comeback. Shamrocks full back Joanne O'Connell tries to block Niamh Coleman's shot. Tír na nÓg went into an early 0-3 to 0-1 lead, and after Conlon extended the lead with a well taken point the midfielder got on the end of a ball played across the face of goal to put the Brighton based side into a nine point lead. Charlotte Delaney pointed for the Shamrocks as they battled to get back into the game. Tír na nÓg however continued to motor and extended their lead further. Conlon and Grainne Collery put three points over the bar between them. The current Boston champions did not have it all their own way however. Center forward Charlotte Delaney looked dangerous when in possession and the Shamrocks struck back with a goal from Sinead Fadden who finished from a tight angle to narrow the gap. 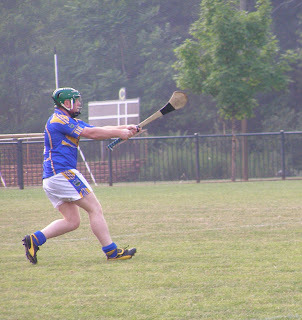 Teresa Doherty added a point from corner forward to make it a five point game. Conlon extended the Tír na nÓg lead to six with a point just before half time, and Tír na nÓg keeper Deirdre Kelliher saved well from Gillian Coyle to prevent the Shamrocks from getting any closer before the break. Coyle did better with another goal chance just after the restart and finished a sweeping downfield move to bring the Shamrocks within two points, but some stout defending from Andrea Bowie at wing back and Lisa Brick at full back held off an early second half Shamrocks assault. Laurie Ahern, partnering Conlon in midfield for Tír na nÓg, lifted the siege with a point and followed with a second and the day looked like it would belong to the girls in red and black. After Sinead Fadden put one over for the Shamrocks, Conlon hit with a second goal. Ahern added another point. Jennifer Norman put a consolation goal away for the Shamrocks. A good win for Tír na nÓg, but based on the Shamrocks fighting display the Brighton side will not have it as easy a run at it this year. Tír na nÓg: D. Kelleher, L. Gilmore, L. Brick, C. Donovan, A. Bowie, A. Kelly, A. Waters, E. Conlon, L. Ahern, C. Hanley, N. Daly, N. O’Neill, C. Kelly, N. Coleman, G. Collery. Shamrocks: C. Dolan, N. Nugent, J. O’Connell, J. O’Doneghue, N. Hurst, A. McDonnell, M. Corrigan, C. McGinley, J. Norman, S. Moloney, C. Delaney, J. Sloan, G. Coyle, S. Fadden, T. Doherty. 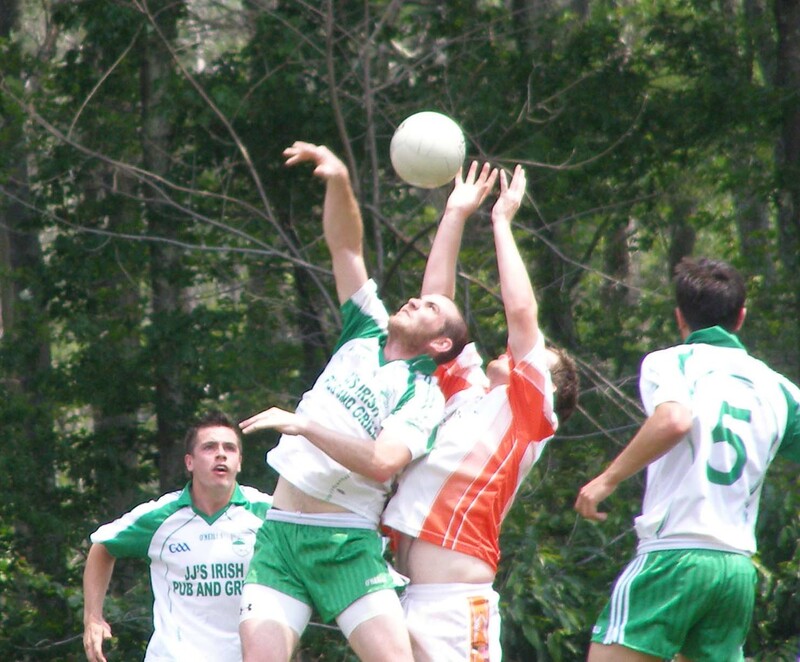 The Connemara Gaels tallied their second win the junior B divison with a comprehensive win over Brighton based Armagh-Notre Dame. Two first half goals, one each from Kevin Feeney and Mikey McDonagh, along with some smothering defence were the keys to a well earned win. 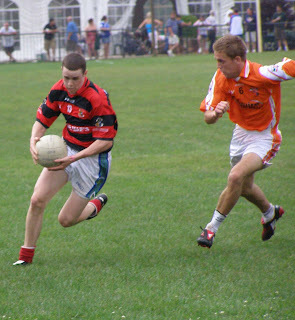 The Gaels Gary O'Malley and Armagh-Notre Dame's Paddy McGoldrick contest a kickout. Kevin Feeney showed in the early going at corner forward with a goal and two points, while Mike McDonagh added a second goal as he surged forward from wing back. 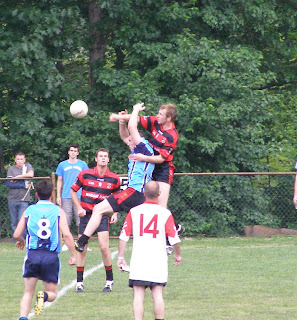 The Gaels worked the ball well from the back line, and the forwards put the possession to good use. Adrian Murphy was pivotal at center back for the Gaels and used the ball well. Murphy also popped up from the half back line to float one over the bar. Armagh-Notre Dame threatened on occasion. Gavin Hall pointed and Colin Bradley almost volleyed into the net just before half time, but the corner forward’s show shaved the top of the crossbar. The Gaels led by a score of 2-5 to 0-3 at the half. 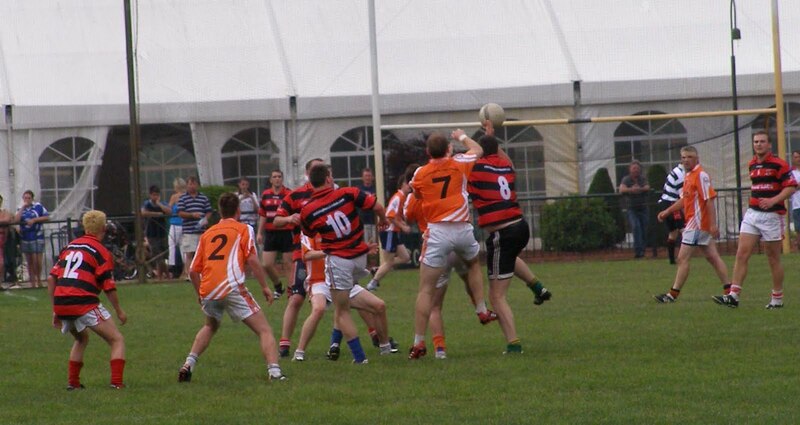 Kevin Owens looks for a way though the Armagh-Notre Dame defence. The Gaels continued to press home their advantage in the second half. Gary O’Malley and Darren O’Meara worked hard in the middle of the field and points came from the boot of Kieran Cox, Vinny O’Malley, Simon Hickey and Kevin Owens. In spite of some good performances from Cormac O’Toole, Hall, and Bradley, try as they may the Brighton side could not turn the tide. A good second win for the Gaels juniors while the northerners still in search of their first. Gaels: B. O’Halloran, C. Conroy, K. Lowe, C. Lafferty, A. Murphy, M. McDonagh, D. O’Meara, G. O’Malley, M. Conroy, K. Cox, V. O’Malley, K. Owens, K. Feeney. Armagh-ND: E. Murphy, S. McKenna, D. Gallagher, P. Tanney, V. Fitzpatrick, S. Butler, C. O’Toole, P. McGoldrick, G. Hall, P. Curran, M. Kirby, C. Bradley, J. Hickey. 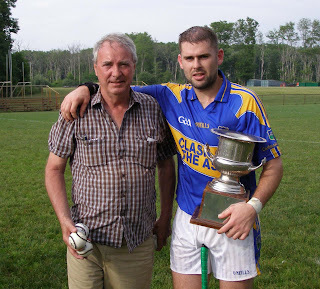 Since the last reports I posted from 2 weeks ago, Aiden McAnespies scored a comprehansive win over the Connemara Gaels to make it 2 out of 2. The Gaels bounced back last Saturday to beat Mayo by a score of 2-11 to 0-5. Shannon Blues are also sporting a 100% record with a win over Donegal a week ago, while Kerry did well to beat Armagh-Notre Dame last Saturday by 2-6 to 1-7. Football games to be replayed this week are Cork v Galway and Donegal v Wolfe Tones. Both games got started last Sunday only to cancelled within minutes as thunderstorms and torrential rain hit just at the wrong time. Looking across the field from the shelter of the press box after the teams left the field, the picture below tells the tale. Those Donegal supporters are a loyal bunch! Three games were cancelled in Canton Sunday due to torrential downpours. However, two senior football games were played Saturday. The Connemara Gaels defeated Mayo 2-11 to 0-5. Also, Kerry beat Armagh-Notre Dame by 2-6 to 1-7. There were some games played Sunday that I managed to catch. Tir na nOg had a good victory over the Boston Shamrocks in Ladies senior football and the Connemara Gaels juniors defeated Armagh-Notre Dame. Reports to follow on those. 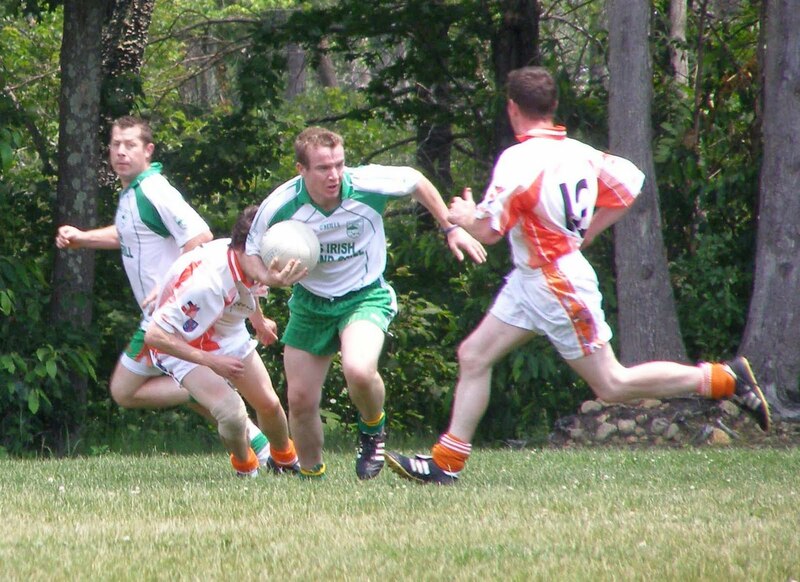 Also, the Shamrocks juniors turned the tables and beat Tir na nOg by a point later in the day. 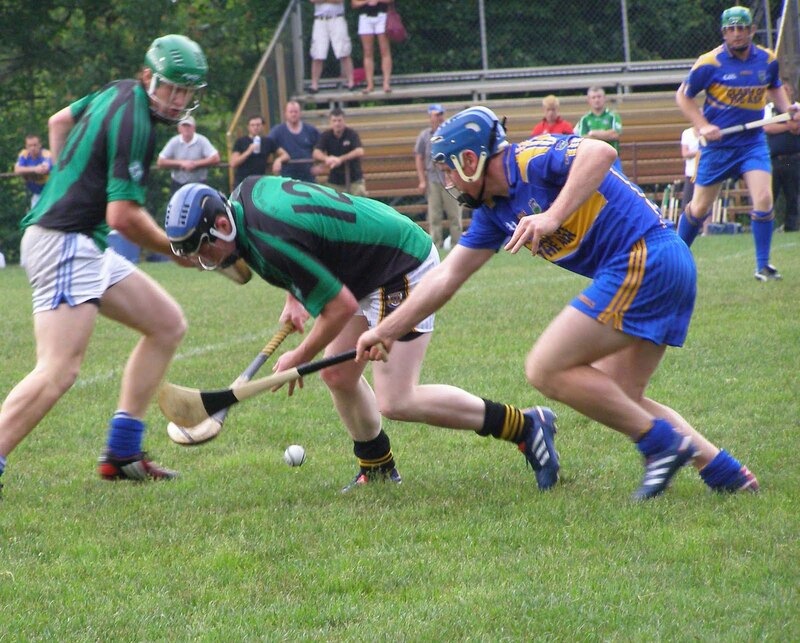 The senior hurling fixture between Fr. Tom Burke's and Cork will be replayed Monday night, while the senior football match fixtures between Galway and Cork, and Wolfe Tones and Donegal replays are TBD. 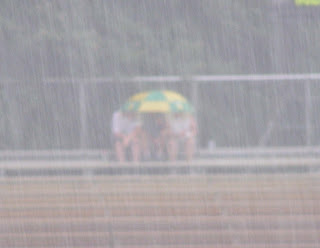 Games for Sunday, June 13, were postponed due to persistent rain making the field unplayable. Run down on Sunday's action with Denis O'Brien. For the second week in a row the Wolfe Tones cruised to a comfortable win, this time over Galway. The writing was on the wall from the start. Dan McCabe fired over two quick points before the half was scarcely a minute old. Try as they might to make some inroads, Galway struggled against a stronger Tones side and the game was reduced to target practice for the South Boston side for the last 20 minutes. Mike O'Brien lines up a shot for the Tones. At half time the Tones lead was not an insurmountable one. Galway trailed by five points, 0-2 to 0-7. McCabe’s opening salvo was added to with a point from Donal Armstrong. Galway opened their account after 12 minutes with an Adrian Kelly point. Anthony Reddy was called upon in the Galway goal to pull off some good saves as the Tones pressed for an early goal, but credit to the Galway defenders for preventing one for the duration of the game while under pressure most of the time. The Tones put another 3 unanswered over the bar from Armstrong, Gary Brilly, and Marty Farrell before John Joe O’Neill pointed for Galway. Brilly again pointed before the half time whistle to put the Tones five to the good at the break. The second half was more of the same, and worse from a Galway standpoint. The Tones tallied 10 points to a single score for the Brightonians. Dan McCabe added to his two early first half points with another, but not before the Down man should have done better with a goal chance after Brian Fineran burst through the Galway defence and put McCabe through on the edge of the small square. Gearoid O’Connor and Pat Hackett were among those who continued to battle for the Tribesmen, but Galway remained scoreless until late in the second half when Shane Melia put one over. Farrell, Fineran, and McCabe continued the scoring for the Tones before the final whistle. The Tones top the table with two wins from two games, but it appears that some tougher tests lie in wait for the Southie men. Tones: B. Murray, N. Devereaux, D. Maguire, K. Regan, B. Fineran (0-2), M. O’Brien (0-1), J. Farrell (0-1), M. Magee, M. Farrell (0-3), G. Brilly (0-3), D. Armstrong (0-2), D. McCabe (0-5), S. Kelly. Galway: A. Reddy, S. Murphy, P. Cummins, J. Keogh, S. Gallagher, JJ O’Neill (0-1), T. Walsh, G. O’Connor, D. Corbett, P. Nolan, P. Hackett, A. Kelly (0-1), D. Redmond. Sub: S. Melia (0-1). The North American and Boston champions, Christopher’s, took the field for the first time this season when they faced Armagh-Notre Dame. Suffice to say that it did not go well for the defending champions. Armagh-Notre Dame, who themselves were coming off a heavy defeat to Donegal last week, ran out comfortable winners. Having taken a substantial early lead, Armagh-Notre Dame cruised for the second period to win their first points of the championship. Both sides contest a kickout. Christopher’s got off to a slow start and some sloppy play did not help their cause. It took some time to shake off the rust, but by the time if was shaken it was too late to mount a serious challenge to the Orchard men. The northerners led by 10 points at the half. Some newcomers to the Brighton based side helped their cause, Craig Berrigan in the middle of the field, along with Johnny Cooper in the back line and David Quinn at corner forward tightened up a side that was well beaten the previous week. As Christopher;s were finding their stride, their opponents were firing over the points. 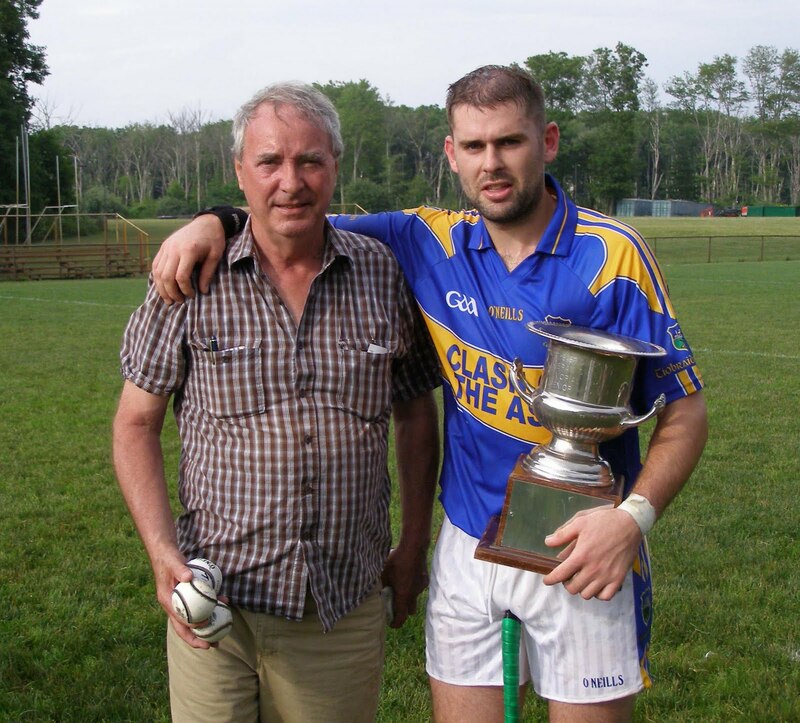 Quinn and Darren Gilsenan caused grief to the Christopher’s back line, and after 20 minutes Quinn showed some quickness to shake off his man and the man from the Na Fianna club in Dublin netted. At the other end Cathal McNally almost did the same for Christopher’s but the Kildare U-21 fired his shot over the bar when a goal might have done much to settle Christopher’s. 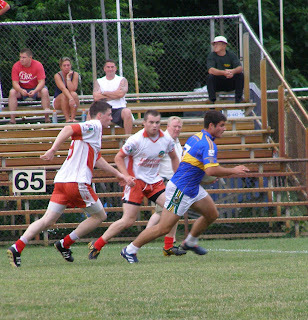 Christopher's Cathal McNally is pursued by Johnny Cooper. Christopher’s settled somewhat in the second half, but at that stage the horse had left the barn. David Nation, McNally, and Mark O’Sullivan pointed. O’Sullivan had entered the fray but found it tough going with the attention of Conor Brophy keeping the big man under wraps. The Brighton side continued to add to their tally. The hard working Quinn goaled again and additional points came from Fergal McClelland and Shane Murphy before the final whistle. Christopher’s spent much of the half in search of a goal and generated a few chances, but their opponents kept them from netting a consolation goal. A good outing for the current Boston Intermediate champions, and some work to do for the senior holders. Christopher’s: P. Kenneally, N. Ryan, G. O’Riordan, P. Moloney, C. Brosnan, B. Kelly, D. Kenneally, J. Kenneally, J. Moylan, J. O’Leary, D. Nation, E. McCarthy, C. McNally. Armagh-ND: P. Geraghty, G. Gilsenan, C. Brophy, A. Doyle, J. McCormick, J. Cooper, C. Berrigan, S. Dineen, S. Murphy, D. Magill, D. Gilsenan, D. Quinn, S. O’Hare. The Gaels breathed a sigh of relief when the final whistle sounded as the boys from western county Galway led by seven points at one stage only to see the lead evaporate late in the second half. With minutes left on the clock Galway leveled the scores, but wing back Andy Kelly scored the winning point for the Gaels with time running out. The opening 10 minutes were evenly contested. Galway opened the scoring with a point from Gearoid O’Connor. The Gaels gradually got a grip on the game. Corner back, Pat McNicholas, and wing back Ian Sexton started to get on top of their men, while Rasharkin, Co. Antrim man, Benny Hassan proved to be a pivotal factor in the middle of the field. Featuring four men from west of Galway city, the Gaels forward line rattled off seven unanswered points. Corner forwards Coleman Mulkerrins (Carna/Cashel) and Sean Conneeley (Rosmuc) accounted for most of the scores, while Tom McDonagh (Lettermullen) and Hassan added to a tally that saw the Gaels hold a 0-7 to 0-1 lead at the half. The Gaels continued to play well in the early stages of the second half and extended their lead to seven points, but Galway had a comeback in them. The tribesmen took advantage of some sloppy play by their opponents to rein in the deficit with points from Danny Reddin and Gearoid O’Connor. Peter Nolan and O’Connor further cut into the Gaels lead, when Reddin hit with a goal as he ran through the Gaels defence and rounded the keeper to fire into the empty net. With the Gaels reeling having seen a commanding lead reduced to a point, O’Connor tied the game for Galway. With the result still up for grabs it was Andy Kelly who rescued the Gaels as with minutes left the wing back latched on to a loose ball and put what proved to be the winner over the bar. Galway almost leveled again, but a gallant comeback ended up falling just short for the Brighton based side. Gaels: B. O’Halloran, P. McNicholas, H. O’Neill, S. McKiernan, A. Kelly (0-1), I. Sexton, B. Hassan (0-1), S. Cashin, T. McDonagh (0-1), M. Geoghan, L. Gallagher, C. Mulkerrins (0-5), S. Conneeley (0-4). Galway: D. Reddin (1-3), P. Nolan (0-2), G. O’Connor (0-3).